We received this item in a timely fashion. The set was just as described. This is a beautiful set. Very well put together. We have already received compliments on the set. Let our Corvus Trey 6-piece patio furniture set add versatility and comfort to your summer patio. 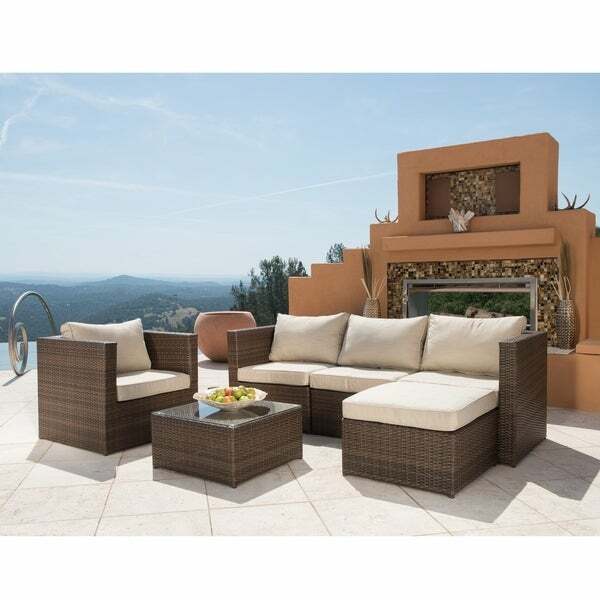 This 6-piece set of outdoor furniture features all aluminum frame and hand woven resin wicker for lasting durability. This set allows you to setup for various outdoor events any way you choose. Available in 2 color options, the cushions add extra comfort and have removable, washable covers for easy cleaning. Dimensions 61.0 In. X 32.0 In. X 32.0 In. Delievery service (Ceva Logistics) was the worst - no white glove serviced provided as stated on description. The set is not what it seems. Seems bigger in pics than in person. Cushions are thin and shallow. The back support only covers lower back. But the chairs themselves are sturdy. Regret ordering something that I couldn't see in person (especially when spending a decent amount). Absolutely love the Corvus Trey 6-piece outdoor wicker set. It is very comfortable and looks great! There is very little assembly required. I am so excited about how it looks on my patio, I'm considering ordering another set. I highly recommend this sofa set! I'm a small person and I find this furniture to be too shallow. My husband almost looks funny sitting on it. It is sturdy, the fabric and cushions are ok. I'm a bit disappointed, but decided to keep it. It is a very cute and good looking set. It is light as well as easy to set up. However, after we put it together, we realized that it was too small for us that we had to return it. The customer service from overstock was super nice and helpful that made the return process rather easy. I really appreciate it! Would definitely look into more products here! Not what I was expecting. This set looks much smaller in person and is not very comfortable. The cushions are very small and hard. I was disappointed at the price for the quality it is. I read a lot of great reviews about this set but it is not at all what I had hoped it would be. This furniture is very high quality and virtually no assembly is required. The material is durable yet soft, and it looks very modern and elegant. Very pleased with it. This set is nice. I just wish I would have measured it prior to purchasing. It was a lot smaller than I anticipated. The set is of nice quality. I could have just used something larger for our space. Product arrives in 2 boxes and are very well packed. Was amazed that all items fit into just these two boxes. Product was great for the price. Seats are a little low to the ground but make great lounging set. I purchased the warranty as well so I can’t wait to enjoy our new set this summer. Was pleasantly surprised that the set didn’t require any assembly after reading some of the previous comments about it requiring 2 people. Just took it out of the box and snapped a couple of clips on. The cushions are thick and firm. Can’t wait to put it on my deck. Took only 2 days to deliver from when I placed order! Patio set pretty to look at when set up with some throw pillows and outdoor patio rug. I was happy with my decision to purchase it! This set just arrived and it is stunning! The pillows are soft, the seats are comfortable, and the layout is quite functional for our patio layout. And at a great price! "Can you purchase the dark brown wicker set and get the blue cushions instead of the beige cushions? Thanks"
This set can only be sold like you see on the website. "The picture shows 6 pieces why is it advertised as 5 pc?" Unfortunately this item is out of stock at this time and we do not have inventory to check. We apologize for any inconvenience. "If I wanted to add to this set later are there matching peaces that I could add individually?" We do not have any other matching pieces at this time. Best value. The look and number of pieces for the price. Also the fact that it comes assembled was a plus!!!! This would look amazing on my front patio. Looks great and good reviews. price is right for amount of items. This will arrive to you assembled.